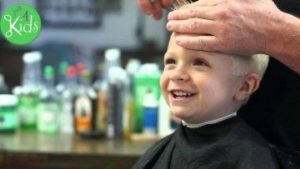 Baby's First Haircut Certificate - First Kids Haircut Package - Book Today! Our First Haircut package is the perfect service for a very special family moment! Your baby’s first haircut is a priceless, once-in-a-lifetime event! Just 4 Kids Salon’s Baby’s First Haircut Package is a celebration that your entire family is invited to partake in. We promise to deliver a wonderful experience and a “baby-book worthy” keepsake to cherish forever! Our experienced staff are specially trained to cater to children, including the patience and the skill set to get the job done right! **Parents! In order to serve you better, effective May 1, 2018 – there will be a $5 surcharge for all weekend services. 1.) Sensitive Children Need Special Treatment – If you think your child might be a candidate for excessive squirming or crying, feel free to stop by just to take a “dry-run” tour of our salon. Further, it is important for them to slowly get comfortable with our facility and our staff. 2.) Book an Appointment During the Week – We tend to be less busy first thing in the morning on weekdays. Consequently, this is the ideal time for an appointment, as there will be less distractions for your child, which will help to optimize their comfort level. 3.) Space it Out if Necessary – We are happy to accommodate your child’s preferences and can space out the haircut into two or three sittings over a week if required. Parents! 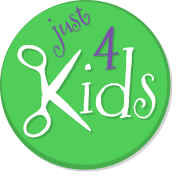 Call Today to Book a Baby’s First Haircut Package at Just 4 Kids Salon! Click the “Book an Appointment” tab above, or call (201) 653-KUTS (5887). Finally, Check out some client testimonials about our First Haircut Package! Went here for my son’s first haircut and was very pleased. Samantha was very patient with my son and took her time. Furthermore, since he was only one year old he didn’t always sit still – but she still did a great job! Also, his hair is now stylish and cool! Further, we look forward to going back when he needs his next haircut. Finally, there is a huge parking lot which is definitely an added bonus for Hoboken! Loved our experience today at Just 4 Kids! My 19 month-old son had his FIRST haircut and it couldn’t have gone any better. 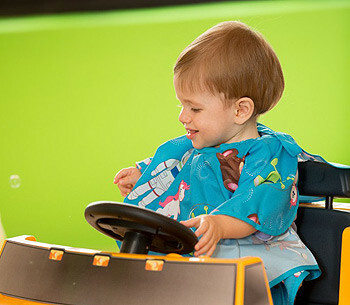 He got to sit in a yellow hummer chair that had a horn and buttons for him to play with, in addition to a gas pedal that made the wheels turn. Also, he also got to watch his own personal TV, which was programmed with tons of kids’ shows to keep him still. Further, the staff so so attentive! They listened to everything we asked for, keeping his hair still on the longer side but manageable :). Finally, they even used all natural hair products to give him an adorable Mohawk just for fun. On the way out they gave us a certificate for his first haircut, with a lock of his baby hair 🙂 Super cute and definitely a parent-pleaser for the baby-book! They also gave him an organic lollipop (they ask first if it is okay! ), and he got to choose a toy from the toy box. He actually started crying when we had to go, so they let him choose a second toy, which was super sweet, and then they gave him a sticker. Happy kid, and super happy parents! Finally, we will 100% be back and recommending Just 4 Kids to all of our friends! We just took my daughter here for her first haircut (there’s a special package), and we had a wonderful experience! What an awesome space! The salon is a great and fully equipped with cars for the kids to sit in that actually have working horns, pedals, buttons, etc. Also, a Baby Einstein video was played, and my daughter was completely blissed out. Furthermore, the haircut was perfect, exactly what I wanted, and then they pampered her with bubbles, a toy of her choice, and an organic lollipop. Also, I got a “certificate” with a lock of her hair for her baby book. We had such a great time, and my daughter loved it. Further, I know I’ll have no trouble convincing her to get another haircut, as long as it’s at Just 4 Kids. Finally, I’m so glad they’ve opened up in Hoboken – We needed a place exactly like this! What a great place! Awesome! We have been waiting for a kids salon to open up in Hoboken. The space is adorable and the staff is great! Had my son’s first haircut here and they were patient and great with him. Also, they gave him lollipops and toys, a certificate with his first lock of hair attached, and extra baggies of hair for his grandparents. Finally, he had such a great time and we will def be back! Highly recommended!